The ongoing uncertainty in Europe has the blue-chip index on its longest negative streak since August 2011. NEW YORK (TheStreet) -- Stocks were driven lower again Wednesday by persistent worries about the stability of Spain's banking system and Greece's future in the eurozone. The deepest losses came early in the volatile session but a rebound off the lows that allowed the Nasdaq to briefly break into positive territory ran out of steam. The bounce was fueled by indications that eurozone officials still plan to release Greece's next round of bailout money this week, a move that will alleviate some near-term pressure on the country while its government is still in transition following this weekend's elections. The Dow Jones Industrial Average shed 97 points, or 0.7%, to close at 12,835, closing in the red for a sixth-straight session, its longest losing streak since August. The blue-chip index, which ran as low as 12,748 on Wednesday, has now dropped 3.4%, or 444 points, over this negative stretch. Year-to-date, the Dow is still up 5.1%. The S&P 500 fell 9 points, or 0.7%, to finish at 1355. The index has fallen in five of the past six sessions but remains up 7.7% in 2012. The session low was 1343. 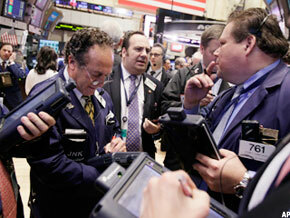 The Nasdaq declined 12 points, or 0.4%, at 2935. As it did on Tuesday, the index started to bounce when it hit 2900. Year-to-date, the Nasdaq has gained 13.7%, but it's pulled back 6.4% since hitting its near-term high of 3134 on March 27. Breadth within the Dow was negative with 24 of the index's 30 components finishing lower. The biggest percentage losers among the blue chips were Boeing ( BA, General Electric ( GE, JPMorgan Chase ( JPM, McDonald's ( MCD, and United Technologies ( UTX. Walt Disney ( DIS was the biggest gainer on the Dow. The stock rose 1.6% after the media and entertainment conglomerate posted fiscal second-quarter revenue Tuesday of $9.63 billion, up 6% from last year and ahead of Wall Street's consensus view of $9.56 billion. Excluding items, earnings came in at 58 cents a share, 3 cents ahead of expectations. After Wednesday's close, Dow component Cisco ( CSCO reported fiscal third-quarter adjusted earnings of 48 cents per share, beating Wall Street's consensus view by a penny, but the stock was down more than 3% in late trades. In the broader market, losers outpaced winners by a ratio of 2-to-1 on both the New York Stock Exchange and Nasdaq. On a sector basis, financials, conglomerates, energy and transportation stocks were under the most selling pressure, while the consumer cyclicals were in positive territory. The VIX, the so-called fear gauge, rose 5.4% to 20.08 The VIX measures implied volatility through options pricing for the S&P 500. A reading above 20 is seen as the point where fear is on the rise. Rumors ruled the day as investors worried that Greece will not receive its latest package of bailout funds, but those concerns were assuaged somewhat towards the end of the European trading session following media reports that eurozone officials weren't planning to hold back the monies. Still, concerns about Spain being the next country to seek a bailout weighed on sentiment as 10-year bond yields rose to 5.8%. There are now worries that Spanish banks will be forced into ramping up provisions to cover for potential losses on their bad assets; and that the banks would have trouble borrowing any money that they might need to satisfy these conditions, given the nation's soaring government bond yields. Spanish officials reportedly want the banks to set aside an extra $45 billion. Meanwhile the political turmoil in Greece continued. On Wednesday, a meeting between Alexis Tsipras, leader of the Greek radical left Syriza party, New Democracy leader Antonis Samaras and Pasok leader Evangelos Venizelos failed to break the impasse between the parties. Tsipras, who has been adamant about cancelling the harsh austerity measures imposed on Greece by its international lenders and hopes that the other parties will do the same, has until Thursday to form a new government. If a coalition is not formed by May 17, Greece will be faced with another general election. European leaders meanwhile are keeping the pressure on Greece to abide by budget measures that were required in exchange for more than $300 billion of bailout loans. The goal has been to have Greece return to financial markets by 2015. Analysts at Citigroup said Wednesday they think there's a 75% chance that Greece will ultimately exit the eurozone, a thought that is deeply disturbing to the markets. If investors have to take big write-downs on Greek debt holdings, they may react also by withdrawing investments from the Spanish and Italian bond markets, forcing those countries to ask for bailouts as well. Right now, the eurozone's bailout out fund of €500 billion would likely be able to handle a rescue of Spain, but it would probably be stretched too thin for additional countries, especially Italy, which has a debt burden of €1.9 trillion. In Europe, London's FTSE fell 0.4% and the DAX in Germany finished up 0.5%. The Hang Seng Index in Hong Kong finished down 0.8%. Japan's Nikkei average slid 1.5%. "I think the dark cloud of a potential European demise is still hanging over the markets and likely will for the balance of the year until U.S. elections dominate the headlines," said Kevin Mahn, president of Hennion & Walsh Asset Management. "If you look at the problem that Europe is having, there's no way to turn it around," said Stephen Hammers, chief investment officer of Compass EMP Fund. "There's no money to fix their problem. They're offering too many entitlements for the revenue they have." "The problem never went away; it's just gotten worse." The benchmark 10-year Treasury was up 5/32, diluting the yield to 1.827%. The greenback was up 0.37%, according to the dollar index. In corporate news, AOL ( AOL, the Internet media company, reported Wednesday first-quarter net income of $21.1 million, or 22 cents a share, up from year-earlier earnings of $4.7 million, or 4 cents. Revenue fell 4% from a year earlier to $529.4 million. Analysts, on average, were expecting earnings of 7 cents a share on revenue of $526.48 million. Shares of AOL rose 3.5%. Social media company Demand Media ( DMD reported Tuesday first-quarter adjusted earnings of $5.9 million, or 7 cents a share, on revenue of $82.9 million, topping analysts' estimates of 5 cents a share on revenue of $79.7 million. Shares of Demand Media surged 8.1%. Shares of department store Macy's ( M slid nearly 4% after the company reiterated earnings guidance of $3.25 to $3.30 a share for fiscal 2012, below Wall Street expectations for $3.41 a share. In economic news, the Commerce Department reported Wednesday wholesale inventories expanded 0.3% in March, below expectations for a rise of 0.6%, and a comedown after a gain of 0.9% in the prior month. In commodity markets, the June crude oil contract slipped 22 cents to settle at $96.81 a barrel. June gold futures shed $10.3 to settle at $1,594.20 an ounce, levels unseen since December 2011. --Written by Andrea Tse and Shanthi Bharatwaj in New York.